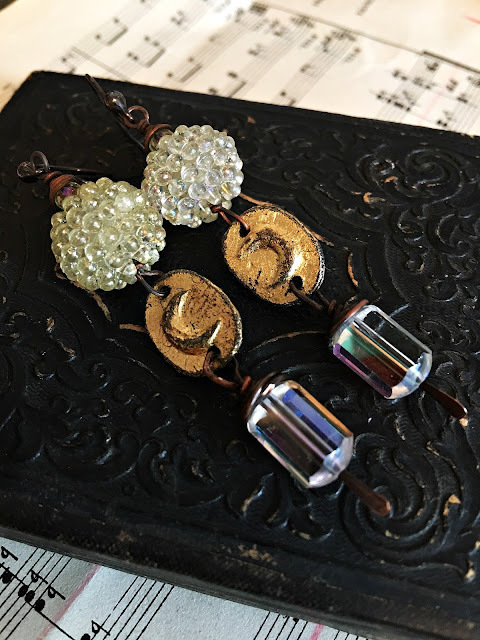 Hello from the worktable of The Earring Whisperer...errr, Loralee! It's late Summer and my mind is already drifting off to my favorite season of Autumn. I love the colors and the night magic of it all! The two featured rustic moon charms are by Terri DelSignore of Artisticaos. 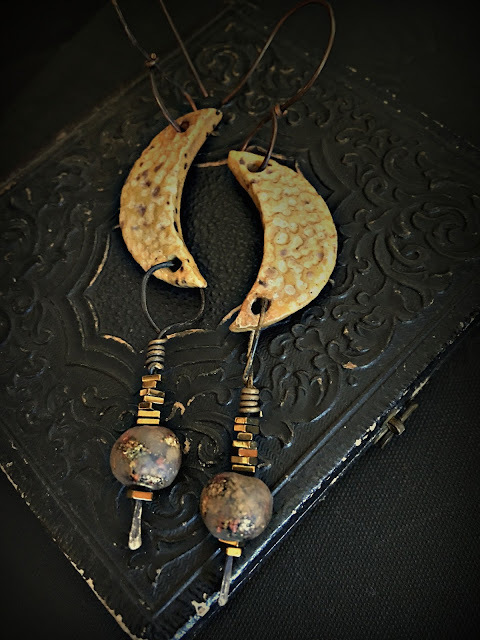 I've fallen completely for her work, it's charming, warm and rustically elegant! I wanted to keep the focus on the crescent shape of the moons, so decided to wire-wrap very pale yellow crystals around the frame. It makes an interesting pattern, yet doesn't overpower the focal. The wire loops were on the larger side with a nice area to work with, so I was able to add charms, too! For a little night magic, I used petite, decorative, eye charms by Inviciti. I had purchased a second pair of crescent moons and at first I was going to build a frame loop but thought...nah, let's put them upright! I really wanted this pair to have a primitive vibe and keep them simple. I made some over sized ear-wires with larger loops not only for a more prominent appearance, but also so the moons would move freely. For the dangling charms I hammered the wire at the ends keeping it rustic. I stacked some bright gold plated hematite and also added these amazing polymer rounds by Marina Rios of Fancifuldevices. Those little polymer beads are wonders unto themselves and complimented the design amazingly. One of my favorite things to do in jewelry design, is to bring unexpected shapes and patterns together. My worktable is purposely cluttered with just about every material and type of bead. Organized chaos. I must try out dozens upon dozens of shapes until that little voice in my head says "yessss". I usually start with one piece that I'm particularly fond of. 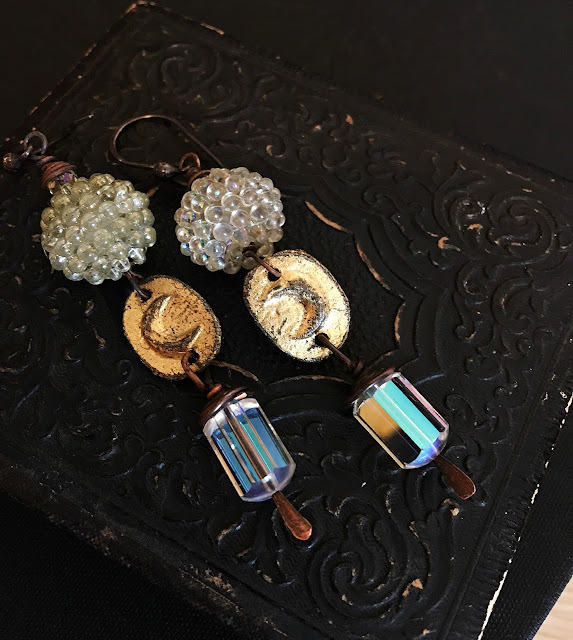 For the pair of earrings below, it was the vintage faceted crystals at the bottom. They are little stunners in person. I suppose I would need to shoot a video to capture the full prism of color they give off. I haven't run across this shape/size very often and frankly, I don't remember where or when I got them! I used little moons, again, by Inviciti. They were the perfect proportion and size. The gold is warm and the scratched rustic texture is a nice contrast to the perfectly, perfect, crystals. Lastly, and I can't explain it, but I love, loveee these little plastic hand-dyed puffs with the other two. I think it lends a softness and a bit of mystery. Each bead completely wonderful on their own, yet together, magic. It is always an honor and a pleasure to share my work with you and I'm thrilled that you stopped by to have a peek! Until next time! Loralee!! You continue to amaze me with your creatively!! 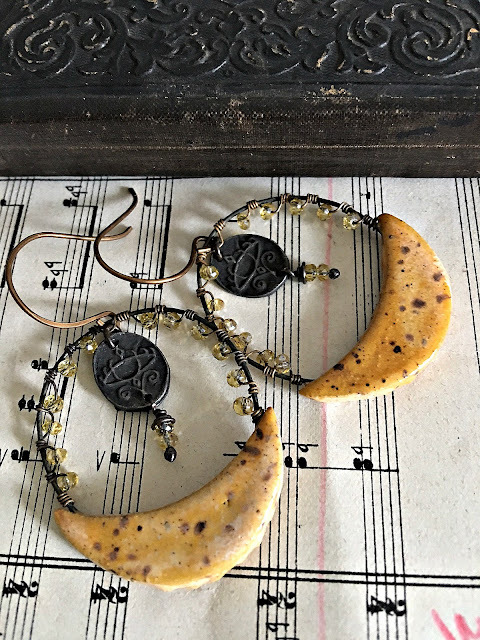 So exciting to see my moon components used in such beautiful, wonderful ways!! 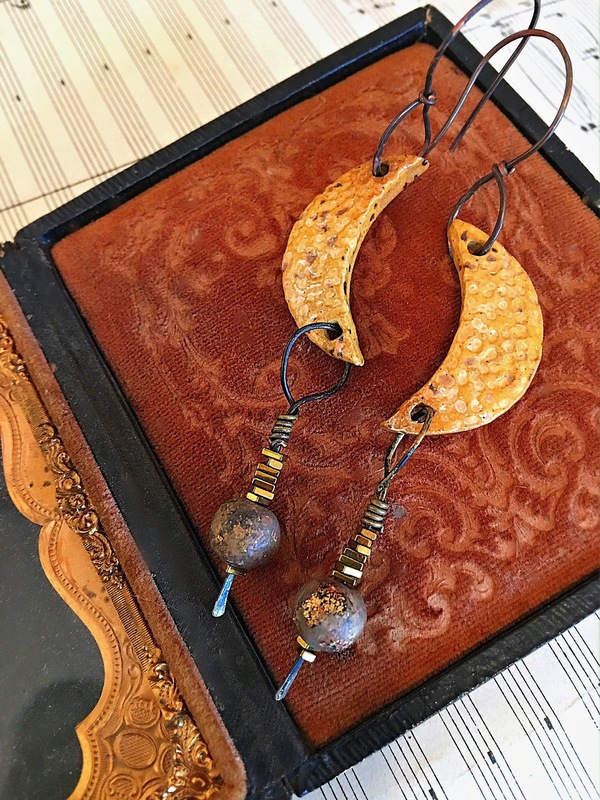 Always a thrill to see what the earring whisperer is up to, but even more exciting to see the ways you use my own work!! Also love the mental picture of you needing organized chaos - me too, me too! !